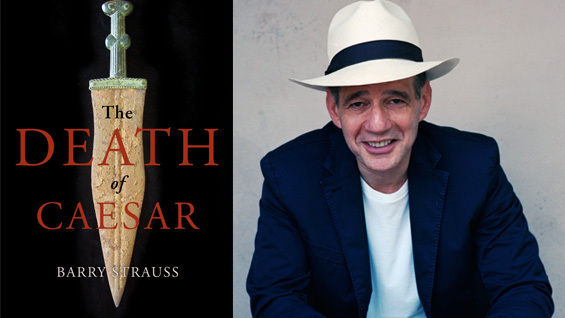 Author Discussion: Barry Strauss on "The Death of Caesar"
Barry Strauss, one of the world's leading experts on ancient history and Chairman of the History Department at Cornell will deliver a free, public talk about his new book, The Death of Caesar. Strauss shows that the plot to murder Caesar was conceived and led by Caesar’s own generals – a plot that was masterfully organized down to the gladiators who provided backup to the assassins. There weren’t two heads of the conspiracy against Caesar but three: in addition to Brutus and Cassius there was Decimus, the mole in Caesar’s entourage and a crucial but forgotten player in the assassination and the wars that followed. And previous assumptions about why Caesar’s killers failed in the end are wrong: it wasn’t the Roman people but Caesar’s soldiers who turned on them. The biggest mistake that Caesar’s assassins made was not giving his soldiers a raise. Bringing the figures of this era into sharp focus and takes us well beyond the usual explanations of republic vs. dictatorship, populists vs. oligarchs and liberty vs. friendship Barry Strauss shows what was at stake in history's most consequential assassination. Barry Strauss is one of the world’s leading experts on ancient history. He has written or edited several other books (which have been translated into ten languages), including The Battle of Salamis (named a Washington Post Best Book of the Year), The Trojan War, Masters of Command and The Spartacus War (which is also being adapted into a children’s book). He is a frequent on-air commentator for relevant specials on PBS, The History Channel, and The Discovery Channel. He writes about the modern politics of Greece, Turkey, and Russia in a regular column for The Hill and is often called upon to address today’s fictional accounts of ancient history like the movies 300 and Gladiator or HBO’s Rome. He is the Bryce and Edith M. Bowmar Professor in Humanistic Studies and Chair of the Department of History at Cornell.